14 Then he went up and touched the coffin, and those carrying it stood still. 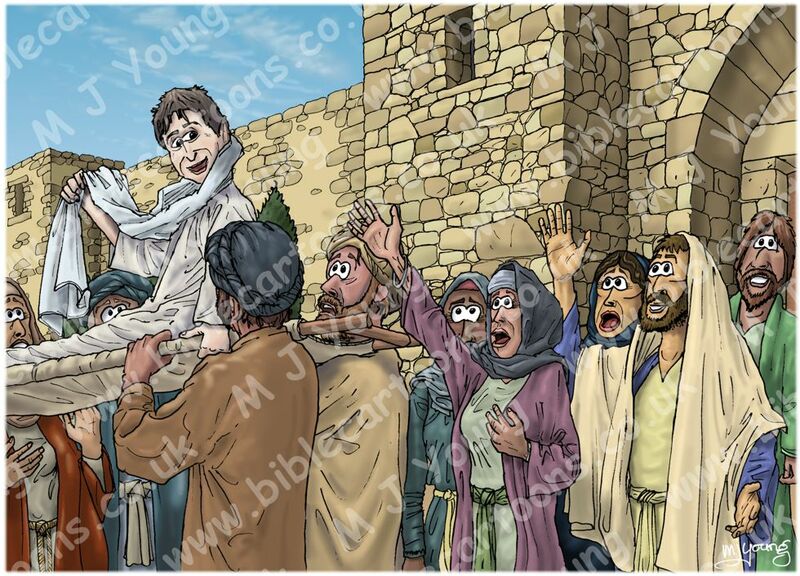 He said, “Young man, I say to you, get up!” 15 The dead man sat up and began to talk, and Jesus gave him back to his mother. The sun is high in the eastern sky, on the left of the scene. Cast shadows are falling to the right of the figures & objects. From left to right: Two members of the crowd, probably mourners. 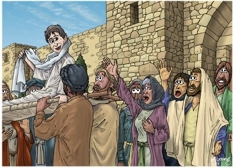 The resurrected son being carried on a litter, or stretcher, who is looking back & smiling at his mother, the widow close to the back of it. Notice he is unwrapping a cloth which had been covering his face & head. There would probably have been four men carrying the body of the widow’s son on the litter or stretcher, we can only see two, at the rear of it. Behind the stretcher, is the widow (wearing a plum coloured outer robe & extending her hand towards her resurrected son) who is clutching her chest & gasping in amazement & delight. To the right of the widow is Jesus the Christ (wearing his customary blue outer robe) who is extending his hand in divine command that the son come back to life. We can just see the face of Mary Magdalene, who is the woman in dark clothing, with her mouth open in amazement. The other people present in this scene are members of the crowd, looking astonished by this miracle! I drew the resurrected son with pale skin, after all, he had just been dead! 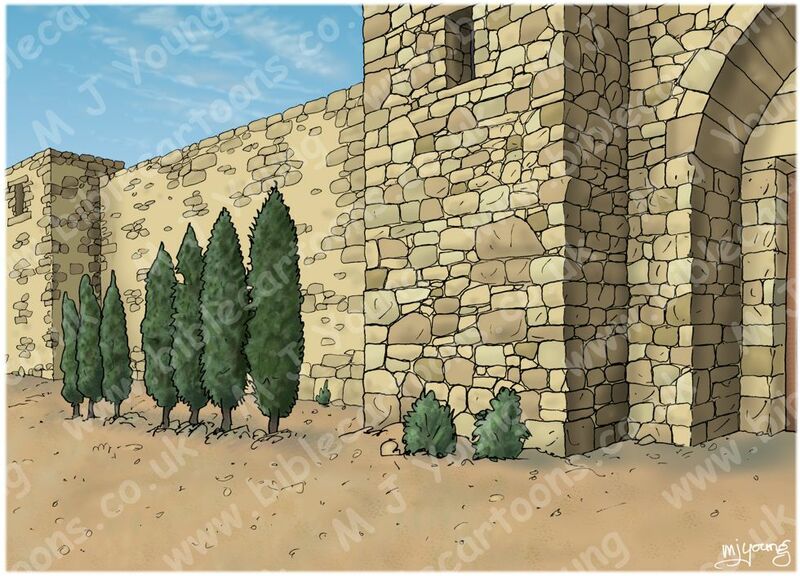 Below is the scene without the figures, which shows the walls of the town & landscape more fully. I have had to assume that Nain had defensive walls, since a lot of towns & cities in Biblical times did. There were a lot of enemy nations that did send armies against towns & cities in the Bible, so walled defences would make sense. However, I must admit that I haven’t found any evidence during my research (on the internet) that suggests Nain definitely did have defensive walls.